This is the story of how I came into possession of the Action 52 Prototype. Flashback to 1988. I was in high school in South Florida. I always had a thing for music. I was a DJ. We spun records back then, not the CD's and MP3 discs that get spun nowadays. Back then it was Technics 1200 turntables with Stanton needles, JBL 4560 speakers or scoops, a Crown or Peavey amp, a Numark mixer, a DJ coffin, and a few crates of 12" singles. I also enjoyed playing the piano and keyboard. So one day I take my Yamaha DX21 synth to school. On the way out of class the boyfriend of a classmate asks about the keyboard and we get to talking. Let's call him MG. Turns out he's into music as well. We end up trading numbers and eventually start working on a Miami dance song with another friend of his, let's call him JF. We practice at JF's house, write and rehearse the lyrics to our soon-to-be hit single and save up for some studio time. We end up saving enough to get a few hours at a decent recording studio in SW Miami. We record the song, lyrics, tracks and go back about a week later to add some sampling, effects, and mix it down to a 1/4" reel as a final product. At some point one of us makes contact with a recording studio and the man who runs it asks us if we would like to come in. I ended up up going alone to meet him for the first time, let's call him MC. Much to my surprise, we was blind. A very gentle, but savvy businessman. I recently read he's doing very well for himself, good for you MC ! We spent a few months there mixing down Club and Dance versions of our song but in some sort of mix up our Master Reel went missing. There was never really any formal or plausible explanation as to why. My thoughts now are that the true owners of the building figured the Master was their property (even though it wasn't because we had recorded it somewhere else) and got tired of the studio not making them any money. Fast forward a year or two and MG and I are still in touch. He tells me he's working with AH, another friend of ours, on a Nintendo game cartridge. I'm told MG, AH, and J (another friend) were sent to Salt Lake City, Utah for training and that this was going to be a 52 game cartridge. They're working out of Vince Perri's office which also doubles as a recording studio for MC. I had worked with MG at that recording studio several times and even did vocals for a song he was paid to write and record for some guys girlfriend. Back to the story. At first I just go visit late at night just to kill time, hang out, and see how it all worked. I was also into music, computers, and graphics so I was curious. I started going more often. Sometimes taking them groceries and snacks. I was the only one with a job and the only one with money. Slowly but surely, I ended up staying longer hours and spending more time watching them work. I was eventually trained by them on how to design backgrounds and sprite animations. Much to the contrary of the Amiga stories, we worked on PC's using a graphics application called dPaint (for the PC) and dPaint Anim (also for the PC). Eventually I was given 5-10 of the games to design myself. Cry Baby and Time Warp Tickers being 2 of them. Ever wonder why when you die in Time Warp Tickers it says "?Time!" ? It's because that was one of the sampled voices repeated in our Miami Dance Song and I was just into a "time" theme at that point in my life. At some point J, MG, and AH were satisfied with my commitment and agreed to share a percentage of their "points" or profit in the project. I was thrilled. I don't recall ever officially signing any type of work agreement with Active Enterprises and doubt I ever did. I'm fairly certain the other 3 did sign a contract. The guys, as far as I can recall, came in around 11AM and left around 11PM or later most nights. I had college classes at 7AM, rushed home for a nap, woke up at 11AM to be at work by noon, a computer related job. I'd get out of work at 5PM and go to the office with the guys working on the games. Like I said, they'd normally leave between 11PM-1AM, I stayed, alone, till 6AM. Sometimes Vince would come and bring me coffee. We'd listen to some golden oldies and take a break. He never stayed long and there I was alone again till the sun came up. I don't remember Vince or the guys ever asking me to work 60-70 hours a week for no pay but I was young. Never afraid of work, during the summers I was flipping burgers at age 14, a cashier at 15, bagging groceries at 16, and so many more different jobs over those younger years. So that's how it was, for 2-3 months of my life. Oh, yeah, you didn't know ? We had 3 months to storyboard, design, start, finish, and test the project, TOTAL. AH programmed in Assembly doing Binary math by hand till someone had the foresight to buy him a calculator. MG, J, and I did game graphics, and MG did all the music. That's right, 4 guys, 3 months, 52 games, no pressure. And, no money. That's until I talked the guys into letting me ask Vince for some kind of advance. I don't recall the exact number, maybe $1,500. And that's all I ever got paid for those long hours spent on this project. On the subject of time and experience, you guys ever heard of 52 OWNS ? What a great project ! Those guys are really dedicated to the cause. I don't know ALL the details but understand each revised game had\has a designer. Probably someone with more than 2 weeks of training, seriously. Someone with previous experience in game design, programming, sprite collision detection right ? And they've been at it, on their free time of course, since April 2010, 2+ years, 29 skilled, experienced programmers, and lest we forget, there are "52" games in Action 52 so I suppose there should be 23 more programmers added to the effort. Keep it up 52 OWNS, you guys are legends as far as I'm concerned. Just trying to put things into a little perspective. OK, we're back on track. We always had our eyes glued to our monitors. There was no Internet, just dialup and bulletin boards, so there wasn't that distraction. However, we did find many ways to decompress. Including singing along to Elmer Fudd and Bugs Bunny's "What's Opera, Doc ?" over and over. We'd also escape to a nearby 24 hour doughnut shop. Sometimes we'd also call into the Active Enterprises Hotline. Yes, we had a Hotline. A pre-recorded message, usually narrated by Vince, that told the investors the status of the project, updates, important dates, etc. One day in the middle of the project the hotline was updated with "Our computers have been infected with a virus. It's like a cancer that spreads. . I remember it like it was yesterday. Someone had brought in a floppy, not sure who, with a virus and it infected all the PC's. We got that worked out after a few days though. Let's talk about the investors. Ok, so I've read the controversy and seen the videos of the assumptions. The truth is, I was "told" there were Saudi Princes and was hinted at that there were South Florida questionable pharmaceutical independent contractors that were investors. I never met either. That doesn't mean they didn't exist. It just means I never met them. I did meet a group of people Vince brought by the office once or twice. Kind of like a tour of sorts. I remember specifically one guy, not his name, had a brand new Jeep Sahara. I'm fairly certain he was an investor and he was also versed in computers. You read earlier that the office doubled as a recording studio for MC. The area that we worked in was that recording studio area but without the gear. However, it was still soundproofed with insulation covering all the walls and windows. We never saw the light of day. That's until one day, towards the end of the project, Vince was out of town and I was a little wired on soda and tore a hole through the insulation. Daylight ! A few minutes later it all came down. Too bad I hadn't thought of that 2 months earlier huh ? Raul, a man that was around a lot, came that day and saw the insulation ripped down. Vince was a nice man but he ran a tight ship so we didn't know how he'd react. Raul told Vince it was his decision. Raul wasn't a developer. He wasn't an investor either so I'm not exactly sure what his role was. Wonder why the games are so full of bugs. Besides the lack of experience, the 1-2 weeks of training the other 3 got, the deadlines, the working conditions, and the lack of seeing no end, I don't remember ever playing the games all the way through. We may have but it wasn't like we had a team of 20 people doing Quality Assurance. It' s just that simple. We did the best we could with what we were given. And, might I add, we were very proud of our accomplishment. I can't speak for the rest of the guys, but, to this day, I still have very fond memories of those days and what we were able to get done. And just like that, one day, someone said, we're done. The Lights, Camera, Action Intro was added with a hint of Rob Base's "It Takes Two" and we left. That weekend was either Labor Day or Memorial Day weekend. I had rented a room on Miami Beach with my cousin and invited AH, MG, and J to the festivities. MG was a no show but AH, J, I, and some very lovely ladies partied like it was 1999 and had a pyramid of empty beer cans stacked on the window sill so high that we could see it all the way from the beach. After that weekend, I don't remember ever hearing about the project again. I moved away for college and did my thing. After college I moved back and worked doing various computer related jobs, and, one day, cleaning out some moving boxes, I found it. 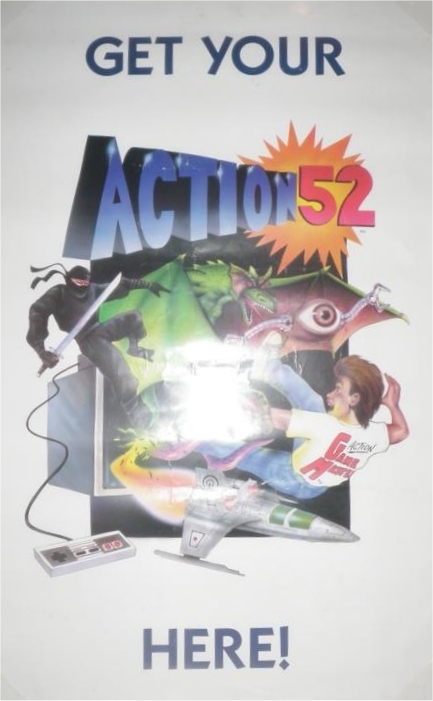 Yes, the Action 52 Prototype, boxed. Along side of it were the posters and flyer's. I did some research and found that the production Action 52 cartridges were selling for $200-$350. And, during that research I came across Mark Weber's article at videogamemuseum.com titled "What's Rarer ? A Prototype Action 52 Cart or a Person Who's Met Vince Perri?" Out of curiosity, I compared mine with that of Greg Pabich's cart, who I read was a video game and movie distributor and was leading the efforts to bring back the Cheetahmen, and found mine to look the same. The only way to know for sure is to play them side by side. So, that same week, the Zelda Prototype that had a Buy it Now price of $150,000 on eBay sold for a record $55,000. And I thought, "What's Rarer ? A Prototype Action 52 Cart or a Person Who's Met Vince Perri ?" I have an Action 52 Prototype cart and worked with Vince Perri and so I put my Prototype cart up for auction along with the bonus artwork. That's where "this" story ends. Be sure to check back for follow-up's as I have a lingering feeling this was just the first few chapters of what's sure to be a long and exciting tale. It's easy, just use the "Follow by Email" service on the right, it'll send you an email with any updates to this blog via FeedBurner. P.S. Vince, Raul, Jeep guy, MG, J, AH, JF, and MC, wherever you guys are, thanks for the memories and hope you're all doing well ! Dont' forget to use the "Subscribe" or "Follow by Email" service on the right, it'll notify you of any updates to this blog, including any new posts and updated news regarding the Action 52 Prototype and any future Action 52 related projects.